In state legislatures across the country, bills to reduce or eliminate greyhound racing are moving forward. This is wonderful news for greyhound advocates, and is further proof that the end of dog racing is inevitable. This positive momentum, however, has once again caused greyhound breeders to resort to the worst kind of scorched-earth tactics. The most egregious example of their desperation is from Iowa, where dog racing supporters are now telling people not to adopt greyhounds from any organization that speaks up for the dogs. 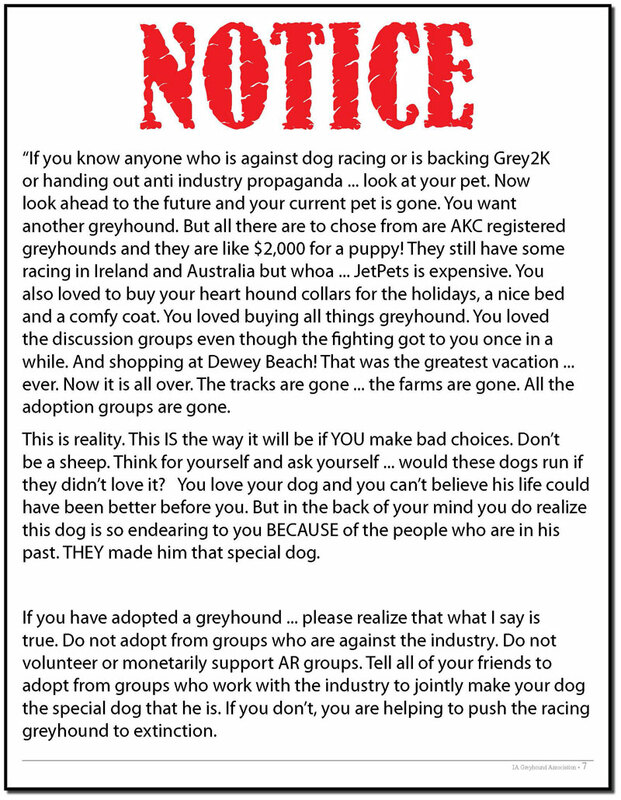 In the current edition of its newsletter, the Iowa Greyhound Association (IGA) published a rambling, full-page diatribe urging greyhound adopters to support the continuation of the industry. This is not surprising, because the IGA represents greyhound breeders. They have a direct financial interest in defeating the common sense legislation now pending in the Hawkeye State, which would both end greyhound racing and eliminate millions in annual subsidies dog racing supporters now receive. "Look at your pet. Now look ahead to the future and your current pet is gone. You want another greyhound. But all there are to choose from are AKC registered greyhounds and they are like $2,000 for a puppy! They still have some racing in Ireland and Australia, but whoa ... JetPets is expensive." "You also loved to buy your heart hound collars for the holidays, a nice bed and a comfy coat. You loved buying all things greyhound. You loved the discussion groups, even though the fighting got to you once in a while. And shopping at Dewey Beach! That was the greatest vacation ... ever. Now it is all over. The tracks are gone ... the farms are gone. All the adoption groups are gone." "This is reality. This IS the way it will be if YOU make bad choices. Don't be a sheep." 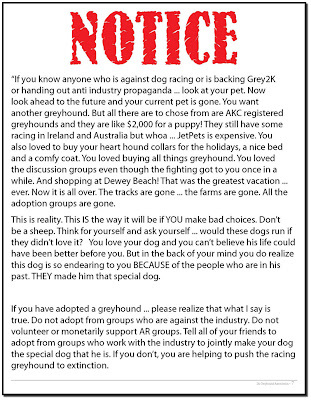 "Do not adopt from groups who are against the industry." 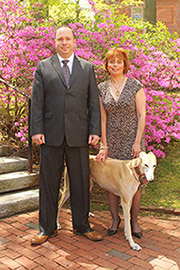 For decades, greyhound breeders have used these dogs for their own personal financial gain. For most of the industry's existence, they simply killed the dogs when they were no longer profitable. In recent years they have started to pawn dogs off on adoption groups, allowing the dogs to find homes and have a second life. This is certainly an improvement, but does not address the underlying problems in the industry, including the cruel housing system the industry uses and the large number of dogs that are injured while racing. Now, the same greyhound breeders who have asked adoption groups to clean up after them want the rescue community to be thankful. Even worse, they want to cut off adoptions by any group that has the courage to speak up for the dogs. This manipulative behavior should not come as a surprise, but is shocking nonetheless. This political tactic could directly result in greyhounds not being adopted, an outcome that is apparently not important to the IGA. Dog racing is cruel and inhumane, and is going to end. When it does, thousands of greyhounds will no longer endure lives of confinement and suffer serious injuries. 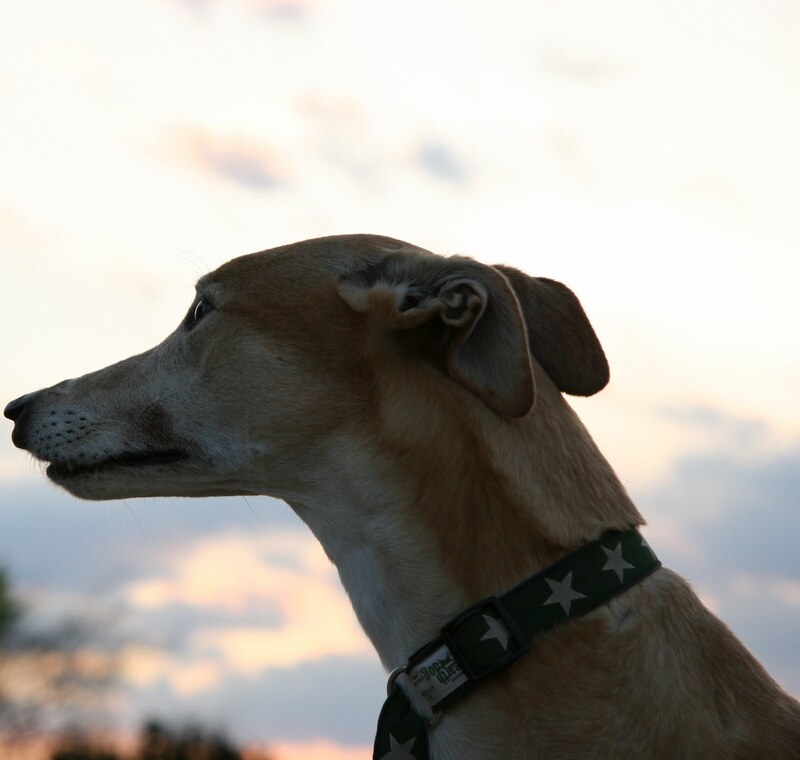 Further, I have a feeling that many of the people who currently rescue greyhounds are looking forward to the day when they no longer have to clean up after irresponsible greyhound breeders. I'm sure they have many other important things in their life they would like to do, and other noble causes to pursue. It's also important to note that the greyhound breed has existed for hundreds, if not thousands of years, long before the dog racing industry. The notion that greyhounds are dependent on this cruel industry is pure nonsense. The end of greyhound racing will be a victory for everyone who cares about dogs. Beneath their manipulative tactics, even the greyhound breeders know this. That is why I am confident their political tricks will not work. In the end, the greyhounds will overcome. How sick can humans get??? Wonderful blog and very intelligent... unlike that "Notice" from the IGA. What a bunch of garbage that is! No one with half a brain would fall for that outlandish propaganda... especially since the source - the greyhound breeders - make their living off the backs of greyhounds! I think anyone can see their motives are less than pure. They are concerned only with their profits, and NOT with the welfare of the dogs. As usual. Agreed. This attempt to sabatage GH adoption groups is actually quite laughable. Seriously!?! The breeders no how many ways they say it....do not have a love of the dog just the sport and the money...I'm really disgusted by this vile and continuing behaviour and quite frankly..I would spend more that my adoption fee if it were every necessary to own a greyhound...can't think of a more wonderful dog to share my life with. Greyhounds are loving a leaner! All the 45mph couch potatoes I have had were wonderful animals. I no longer have any, but if I could physically keep them, I would. Having MS, I no longer can go play with them or walk them. I find it sad that, for all the people against this cruel sport, that is survives. The states where it is still legal should be ashamed that they allow it to continue. I ask all those who read this, to please, PLEASE, contact your legislature and demand this "sport" be condemned as many of these magnificent animals are. Let me see if I got this right, we need to continue this cruel sport so that we, the publlic, will be able to rescue these greyhounds AFTER the tracks are finished with them. Do they really believe that we will buy this??? As with most human pass times that are motivated by gaming, addiction, risk, and greed, we slowly destroy the good in ourselves and those around us to justify it. Despite any attempt at eloquence, the essence of greyhound racing is suffering. Suffering by those least able to choose. The beasts and the children- I wonder if we really are falling apart as a society. In this day and age of re-cycling and reducing waste of all kinds I think we are civilised enough to extend the trend to include animals used for pleasure sports. Stop the unnecessary killing and unnecessary waste product.